It already feels like we’re sitting on top of each other in airplanes. But what if we actually were sitting on top of each other? That’s exactly what a newly awarded Airbus patent suggests. The ludicrous design sounds like a joke, but it’s not. Airbus actually proposed stacking a second layer of seats above the seats in the middle row. There are little stairs and everything. 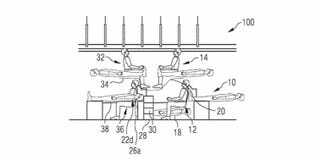 The overarching idea involves both squeezing more people onto the plane and providing passengers with the option of reclining completely. Put differently, you’d get a little more leg-room, but you’d have to sacrifice face-room. Airbus really thought this one through, too. The patent application includes 12 different drawings of various iterations of the acrobatic stacking design. My favorite one features passengers in the elevated seats sitting face-to-face—a design that’s actually been proposed in the past, albeit without the whole elevated seat idea. Did I mention that Airbus is one of the world’s leading airplane manufacturers? This is a real patent that they now own. Of course, as our own Matt Novak suggests, perhaps the company is simply patenting the god awful design so that nobody else will actually build it. Some humanitarian gesture that would be. Contact the author at adam@gizmodo.com.